After I had ridden Brownie for a couple of summers and had him well trained, our young son Michael (age 8) started riding him. Brownie was very flat-footed and prone to stone-bruising. 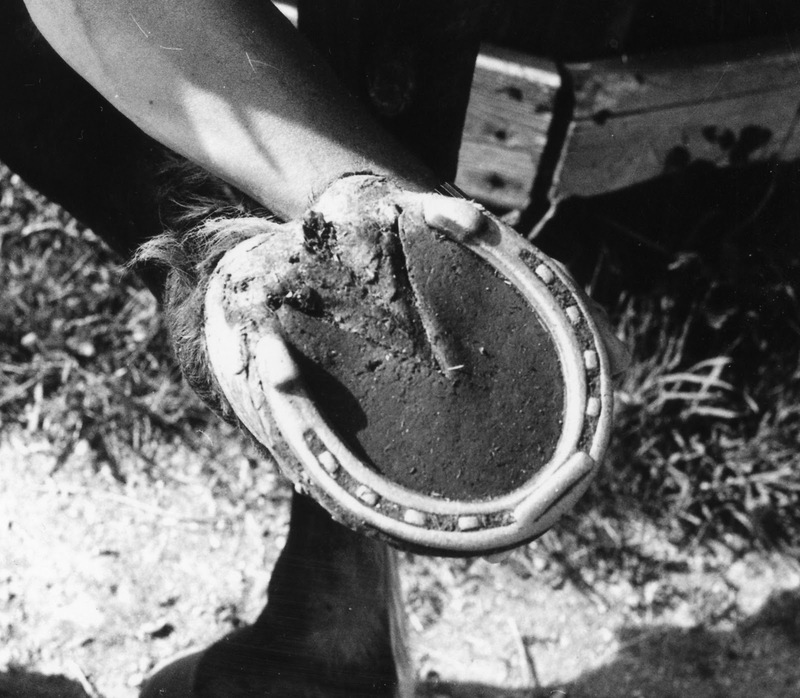 After his second set of shoes, I always shod his front feet with hoof pads, to protect them from bruising. Brownie adapted quickly to being a “kid” horse and was very dependable, though lazy. He soon realized he didn’t have to work very hard, packing a child around. When Michael rode with us to check cattle on the range, sometimes Brownie would lag behind or try to stop and eat grass along the way. He didn’t want to climb the steep hills, and we’d look back and see Michael struggling to get Brownie to go up the hill. Brownie was always easy to shoe . . .
. . . and I shod his front feet with hoof pads to keep them from bruising. Andrea, only 6 years old, sometimes had the same problem with Khamette. 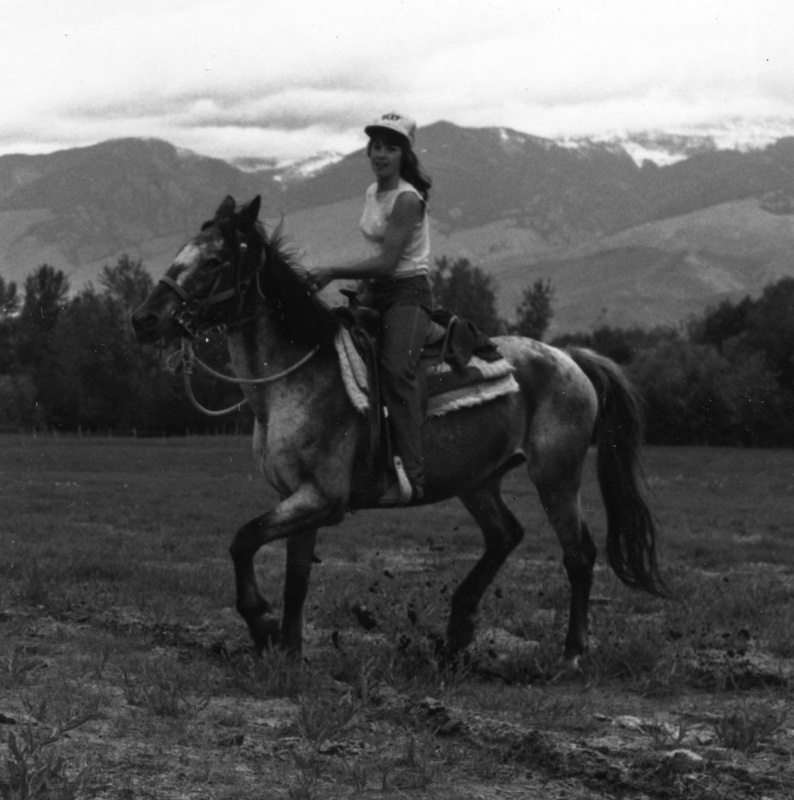 I was still training her young mare, Khamir, and Andrea was riding old Khamette until she was old enough to ride her feisty young mare. 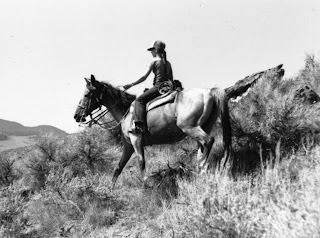 Andrea’s short legs didn’t reach below the saddle pad, and the old mare could hardly feel her kicking. So we bought each child a short riding crop so they could tap their lazy mounts on the rump to encourage them to go, instead of stopping to eat grass along the way. Brownie was usually very trustworthy, taking good care of his young rider. If Michael had to get off to open a gate, for instance, Brownie would wait patiently, even if Michael didn’t keep hold of the reins. He wasn’t as patient with an adult rider. If you didn’t hold onto him, he’d take off and go home, leaving you stranded. whether it was Michael or Andrea. Brownie never bucked with either of the children when they were small, but he did lose Michael a couple of times. First was when we were heading out across our low range to go move cattle. An older lady (whose horses we were boarding) and a young woman who was working for us were both riding with us. I was in the lead, riding a young horse named Ahmahl that I was training. The trail went through a gully, and sometimes the horses tried to jump it. We’d all crossed the gully except Michael and Brownie, when I heard a shriek and looked back. Michael was sitting on the ground — and Brownie was galloping back down the trail toward home. Apparently, Brownie had jumped the gully instead of walking nicely through it, and Michael had tumbled off. Brownie decided to go home instead of following the other horses. He had a pretty good head start, but after making sure Michael was okay, I took off after Brownie. It took me nearly a mile to catch up with him, pass him, and grab his reins. Then came the interesting challenge of leading him back to his young rider. Ahmahl had never led another horse before, and Brownie had never been led from another horse, so they both had a learning experience. We eventually got back to the group and continued our range ride. Brownie got a lot of use, being ridden by both kids. Brownie lost his young rider one other time, when we were all galloping over a mountain to “save” a young doe that was cornered by coyotes on a rocky outcropping. The deer was screaming, and we hurried around the mountain to see what was happening — just in time to chase the coyotes away. But while galloping through the rocks and sagebrush, Brownie stepped in a hole and stumbled, tossing Michael off over his head. The child was unhurt, and since Brownie did stop for him that time, Michael quickly climbed back on and caught up with us. some days off when we were riding range every day. Michael became an excellent rider and never fell off Brownie again. He learned how to anticipate gully-jumping and leaned forward to ride out the jump and keep from being left behind. 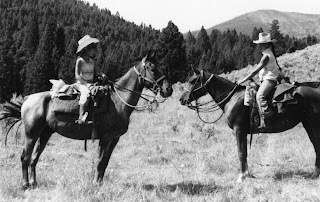 But during one wild cow chase when he and Brownie had to jump a deep gully to head off a wayward cow, Michael leaned too far forward over the horse’s neck and caught his rib cage on the saddle horn. When Brownie landed and Michael snapped back into position, the saddle horn tore his lower ribs loose from his breastbone. He was in a lot of pain but managed to finish the ride, and we took him to the doctor when we got home. The doctor sent us to a specialist because he feared surgery would be needed, but the specialist said the ribs would eventually heal, which they did. 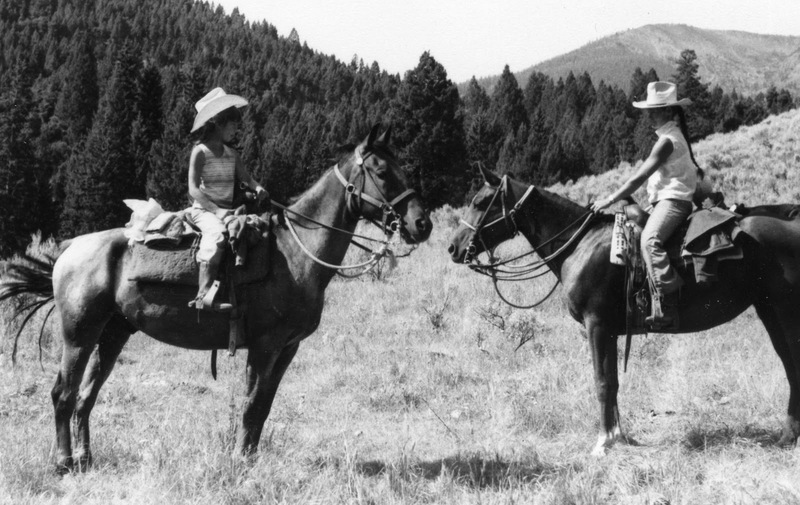 During the 1970s Lynn and I helped put on an annual 40-mile endurance ride that went through our range. The kids and I marked trail for it each year, tying red-painted paper plates to trees and sagebrush along the trail, then picking them up after the ride. When Michael was 10 years old, he was finally old enough to compete on these rides and had his heart set on riding Brownie. He stayed with the other riders the night before the ride, at the camp area on the upper end of our ranch. My dad brought his horse from Boise, and Michael was staying with him. Dad’s horse and Brownie were tied to trees by their tent. Andrea and I rode many miles together to check cows. But at daylight they discovered Brownie was gone! He’d untied himself and tried to come home. He’d come partway down the back side of our place but got tangled in an old wire fence and cut his shoulder and front leg. He’d bled profusely, and his leg was stiff and swollen. 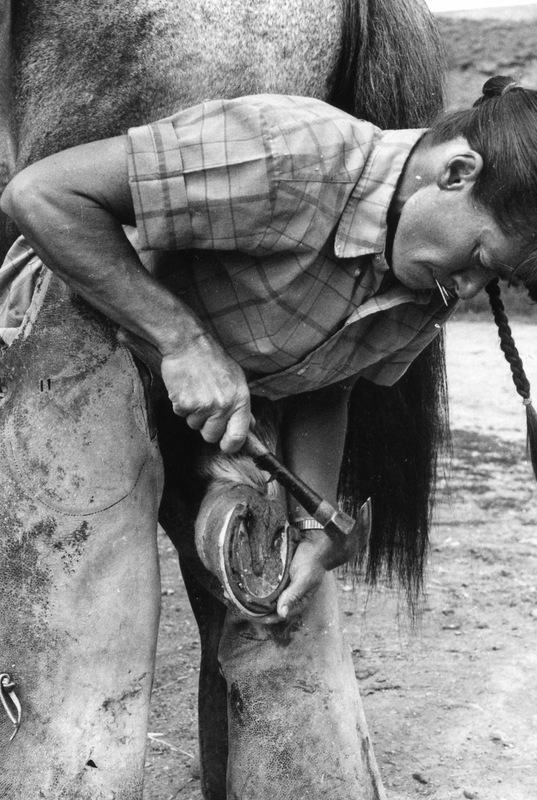 Michael was in tears, not only because his horse was seriously hurt, but also because he would not be able to compete on the ride. So we brought Brownie home in Dad’s trailer and quickly grabbed old Khamette out of her pasture and took her up to the camp. Michael rode her on the 40-mile ride. Fortunately, Brownie’s wounds were just in the muscle tissue, and no tendons were cut. He healed, and by summer’s end Michael was able to start riding him a little. He was completely healed by the next spring, and Michael rode him on the competitive ride that year. As time went on Brownie got a lot of use, being ridden by both kids. 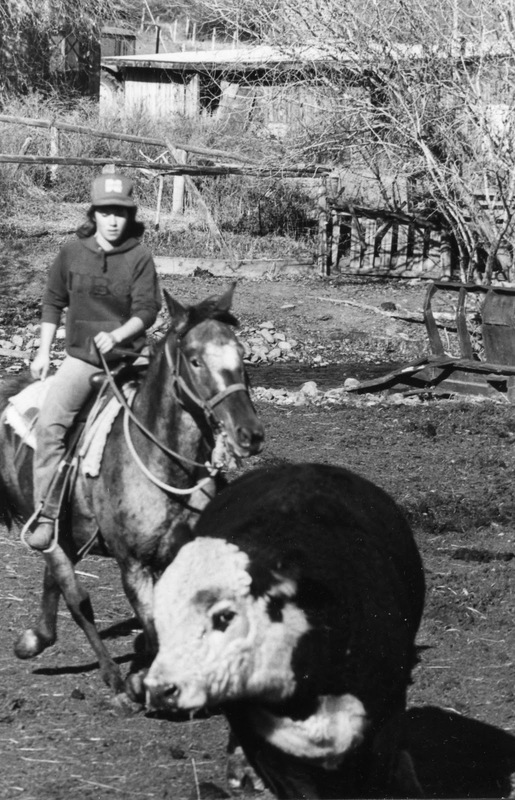 When Michael was busy helping Lynn with the haying during summers, Andrea often used Brownie as a spare horse, to give her own mare an occasional rest. 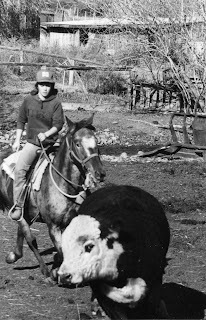 She and I were riding nearly every day during those years, putting in long hours checking cattle, fences, and gates; fixing water troughs; moving cattle. 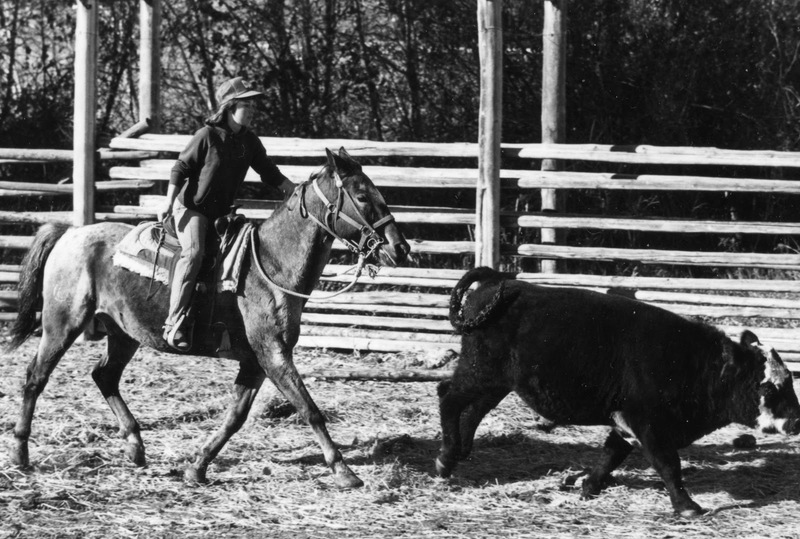 Brownie proved himself to be tough and agile, able to endure long days chasing cows. One of the wildest chases wasn’t on a cow roundup, however, but to catch a wild mustang. Andrea was riding Brownie the day she went with me to accompany our range neighbor Galen Kossler and a young BLM employee who wanted to ride out over our range and map some of the different types of soils and vegetation. The BLM employee (whom we’ll call John) was riding a BLM mustang he’d adopted and was starting to train. 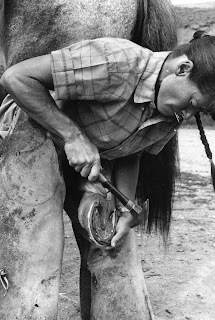 The mare was still unpredictable and was skittish as the young man took her out of his trailer and tried to get on her. As we started out over the mountains, Galen joked about needing a butterfly net to catch him if he got bucked off. I stayed at the scene to make sure John was okay and helped him gather up his clipboard and papers that were strewn over the hillside. Andrea and Galen took off after the departed mustang. 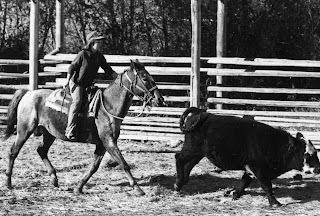 Galen was on a big quarter horse/Thoroughbred that he was very proud of and was sure he could catch up with the mustang, but Andrea — with her cow-savvy experience — charged down through the timber below the mare, to head her off. 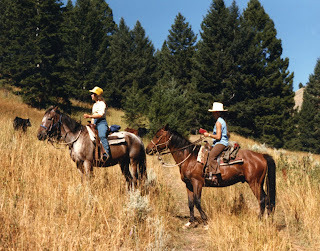 Brownie was used to chasing cows in this kind of terrain, and he got below the mare, running neck and neck with her around the mountain. He and Andrea ran the mare into a big patch of fir trees, which slowed her down, and Andrea was able to grab the trailing head rope. She hung onto the mare until Galen caught up, and then she handed the rope to him. He and his big strong horse were able to drag and lead the mustang back to John. Andrea was very proud of her scrawny little sure-footed cowhorse that day, and John was very relieved that he didn’t have to walk home!